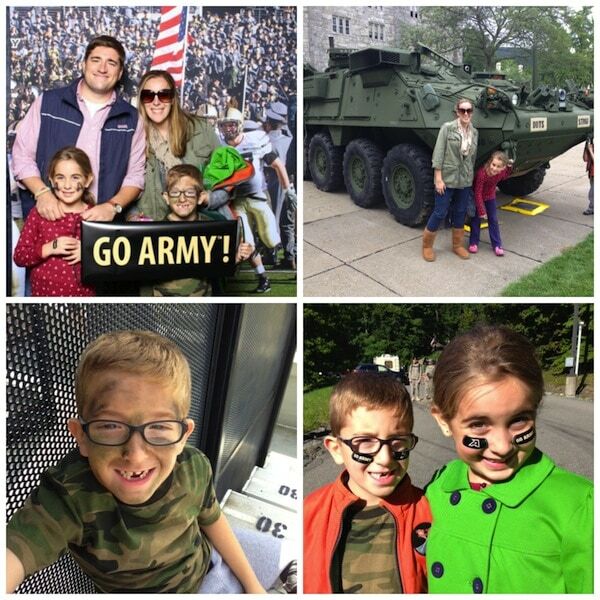 It was an EARLY morning start but believe me it was well worth it because the entire family had a blast at the Army Football game held at West Point last weekend. My son recently joined the Cub Scouts and it was one of the troop’s first outings. How fun! From what I gather, this is going to be an amazing year. The Cub Scouts do really amazing things – like sleep on the Intrepid, go camping upstate, an overnight trip to the Mystic Aquarium, and more! But back to the game – the tickets were $25 a pop. Kids weren’t discounted. We left Caleb at home because I just didn’t want to deal with a stroller all day and it’s a good thing we did. There was a lot of field walking and bus hopping. It would have been a nightmare with a stroller. Plus it was FREEZING. There was even a place to pick up some rocket launchers and guns. Those puppies are HEAVY. Holy moly! Imagine how heavy they are once loaded. You had to see the line of boy scouts just waiting to get their pictures taken while holding those monsters. The game started off with 5 parachute jumpers leaping out of a helicopter and landing on the field. Talk about a sick entrance! Here’s 4,000 Army cadets cheering on their team. 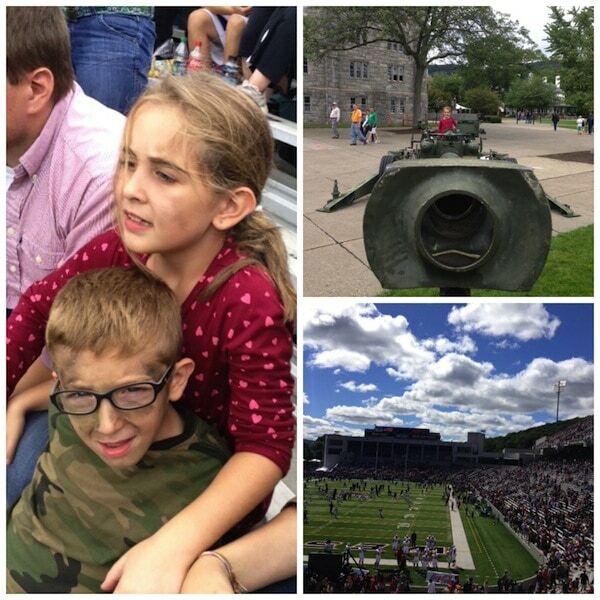 We watched the game until halftime and then decided to walk the West Point grounds. They are just so beautiful. 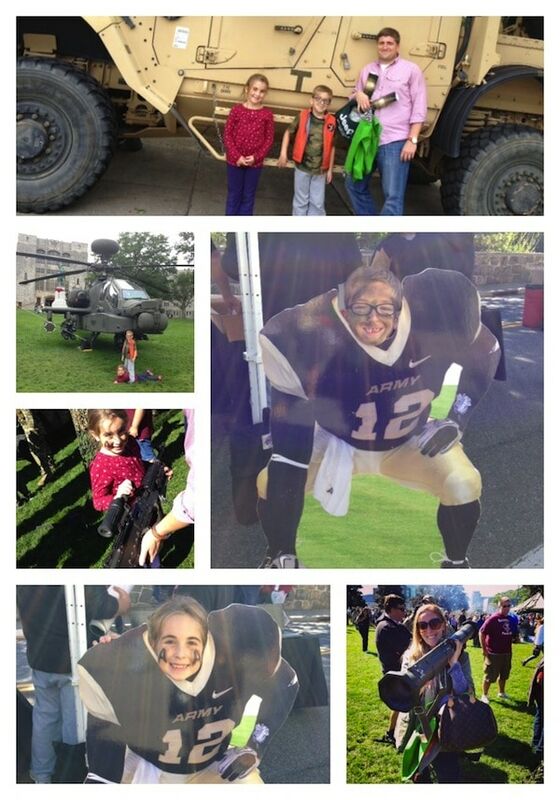 Helicopters and army trucks were on display for you to check out. The kids were besides themselves. If you EVER have a chance to check out one of these games, please DO IT! You will not be disappointed. My son is the cadet that did the camo face paint for your son. Thanks for posting the video!! I am not sure how my 11yr old daughters friend found it on YouTube but I love it. Glad ya’ll had a good time.